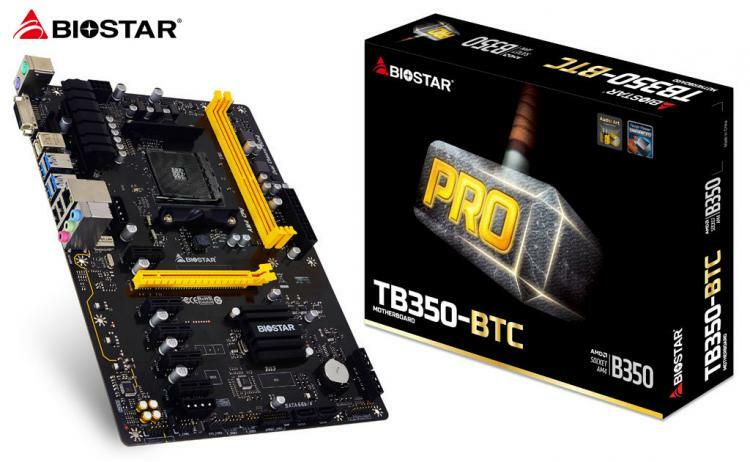 BIOSTAR introduces its first AM4 crypto mining motherboard – the BIOSTAR TB350-BTC. BIOSTAR understands the unique needs of Bitcoin mining which lead to the development of the BIOSTAR TB350-BTC motherboard. The motherboard is also optimized for other cryptocurrency such as Zcash and Ethereum. Paired with the latest generation GPUs available today, it offers faster ROI and the best cost-effective crypto mining solution today. The motherboard packs six PCIe slots supporting up to six graphics cards for mining offering higher hash rates. There are two additional AUX power connectors on the motherboard to support the graphics cards and improve performance and stability for mining. The TB350-BTC is also designed to endure extreme mining conditions running 24/7. BIOSTAR packed the PRO series motherboard with features that support such mining conditions including enhanced support for massive electric current while having low resistance for lower thermals and reduced energy loss. The TB350-BTC offers improved efficiency and performance for crypto mining having support for the latest AMD AM4 Ryzen and APU processors. The motherboard also uses DDR4 memory supporting up to 32GBs of DDR4-2667MHz in dual-channel configuration. It also comes with a Realtek Gigabit LAN offering superb network performance. Visit the BIOSTAR website for more information on the TB350-BTC AM4 crypto mining motherboard.